Bellevue Farm was honored by the Virginia Forage and Grassland Council (VFGC) as the 2018 Outstanding Forage Producer of the Year. The farm is located in Swoope, within the Shenandoah Valley of Virginia. It is owned and operated by Charles and Robert Drumheller, whose family has owned the farm since the mid-1900s. Charles took over the farm in 1988 from his father, and in the mid-1990’s he started the beginning stages of a rotational grazing system. In 2001, he enrolled in the Conservation Reserve Enhancement Program (CREP) and became more interested in rotational grazing. In 2006, Robert returned to the farm and the transition to a more intensive grazing system began and continues to evolve to this day. 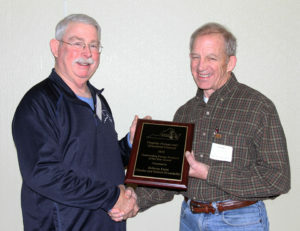 Charles Drumheller pictured right, receiving 2018 Award from VFGC President Alan Spivey. Temporary electric fencing is a simple tool that greatly enhances grazing management on Bellevue farm. Bellevue Farm is a 55 head cow/calf operation on approximately 248 grazing acres split into 21 paddocks that are used for rotational grazing. 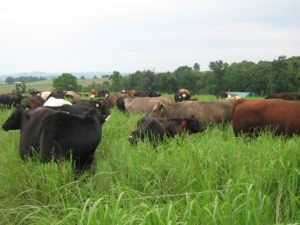 There are an additional 25 custom-grazed beef cows that are grazed on the farm between May and September. The diverse paddocks consist of cool season grasses such as tall fescue, orchardgrass, timothy, ladino clover, and Kentucky bluegrass. The grazing system includes about 3.1 acres of pasture per cow/calf pair in the summer months and about 4.5 acres of pasture per cow/calf pair the remainder of the year. Paddocks are rested for 50 to 60 days before being grazed again. Stockpiled forages are strip grazed using temporary fence starting in November until the entire stockpile has been grazed. In a good year, stockpiled forage will last until April. In the summer of 2017 they stockpiled 18 acres of cool season forage from May until September, strip grazing the forage in September. No annual crops are grown on the farm and hay is made occasionally on the farm by shares with a neighboring farmer. When weather is optimal for forage growth and the winter is mild, no hay at all is fed throughout the year. They only feed approximately 8 tons of hay per year over a period of just 45 days on average. The hay is fed in September/October to allow for stockpiling of forages for strip grazing. Summer perennials provide excellent growth and production for grazing during the summer months. Warm season grasses also provide much-needed habitat for wildlife such as quail and other grassland birds. 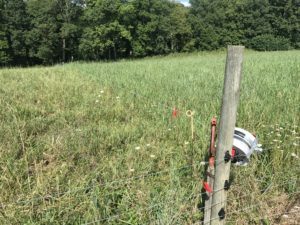 Despite its benefits, the practice of grazing native warm season grasses is only just starting to gain traction in the Shenandoah Valley. Bellevue farm serves as an example of how this system can work well in this area. The warm season grass fields consist of big bluestem, switchgrass, and indiangrass. On average a prescribed burn is completed on these fields every three years. These riparian buffers protect streambanks and greatly improve water quality. This farm has approximately 62 acres of riparian buffer area established through the Conservation Reserve Enhancement Program (CREP), along with an additional 37 acres of woodland excluded from livestock. 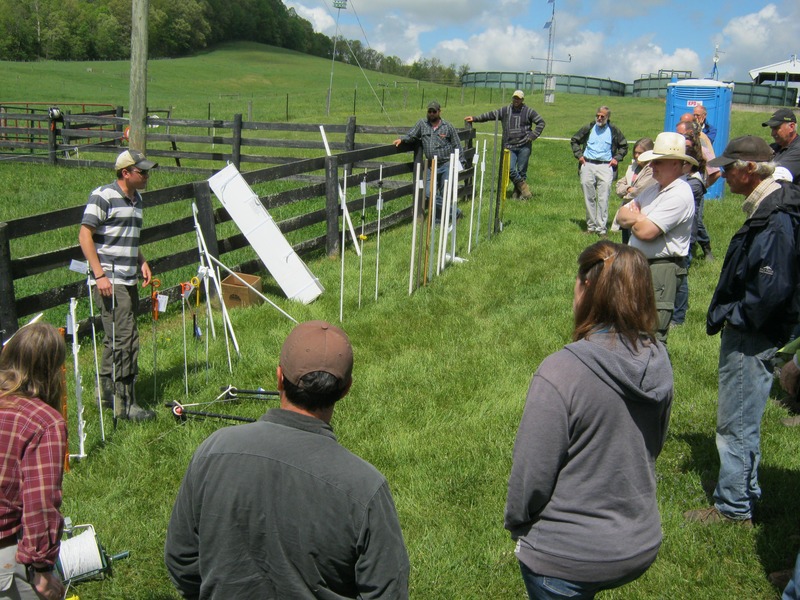 While implementing their grazing system, the Drumhellers have worked with a variety of the resources that are available to farmers in Virginia. They have participated in numerous projects with the Soil and Water Conservation Districts and with USDA Natural Resources Conservation Service (NRCS) through the Environmental Quality Incentives Program (EQIP), Chesapeake Bay Water Initiative (CBWI) programs, and CREP. 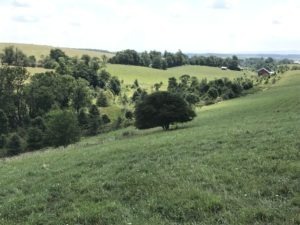 They also have a Virginia Outdoors Foundation Open Space Easement on the farm and a Department of Conservation and Recreation CREP Easement along the riparian area. These programs have been instrumental in providing alternative livestock water and excluding livestock from 100% of their streams, and it has allowed for Bellevue farm to have an active nutrient management plan, NRCS conservation plan, a forest management, and a prescribed grazing plan on the farm. Robert Drumheller pictured above explaining the applications of temporary fencing components at the VFGC grazing school. The Drumhellers have not only done a great job in grazing and pasture management, but they have been advocates for getting other land owners to implement similar practices on their land. Bellevue Farm has hosted various farm tours and trainings, and Robert has participated as an instructor for the VFGC Grazing School on multiple occasions. In the winter of 2015-2016, the Drumhellers participated in a demonstration project coordinated by the VFGC with further assistance from VA Cooperative Extension, NRCS and the Chesapeake Bay Foundation for strip-grazing stockpile over the winter. In July of 2017, the farm hosted a training titled “Native Summer Forage for Beef and Bobs” for all farmers and landowners in the region to attend and learn about the benefits of using native summer forages for both grazing and wildlife habitat. The farm is available for farm tours and educational events at any time during the year. Interested individuals can contact Bellevue farm to set up events or talk to them about their practices.